The Metro has been instrumental in changing the face of Hyderabad, a city that has emerged as a key information technology and manufacturing market in India. 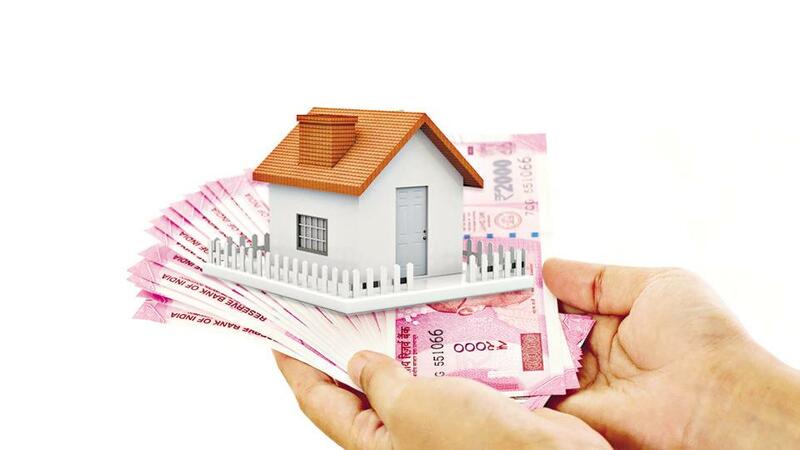 Apart from enhancing the connectivity quotient of the city, the Metro network has also made visible impact on the city’s real estate market, counted among the world’s most promising property market. With the 56 km length operational, it has now become India's second largest Metro Rail network, next only to Delhi. Here is all you need to know about the Hyderabad Metro Project. The project, which is being developed at a cost of Rs 18,800 crore, spans 72 kilometre and has three corridors. Corridor-I (Red Line): The Red Line of the Hyderabad Metro is a 29.2-km corridor, running between Miyapur and LB Nagar. It has 27 stations, including Miyapur, Kukatpally, Erragadda, Ameerpet and Punjagutta, among others. The route became partially operational first in November 2017, and then the second lap was open for public use in September 2018. It has now become the second longest Metro network in India after the Delhi Metro. The Ameerpet station and MG Bus station of this corridor are interchange junctions providing access to the Blue Line and the Green Line, respectively. Corridor-II (Blue Line): Running between Nagole and Raidurg, the Blue Line of the Hyderabad Metro is a 27-km two-phased corridor, with 23 stations. 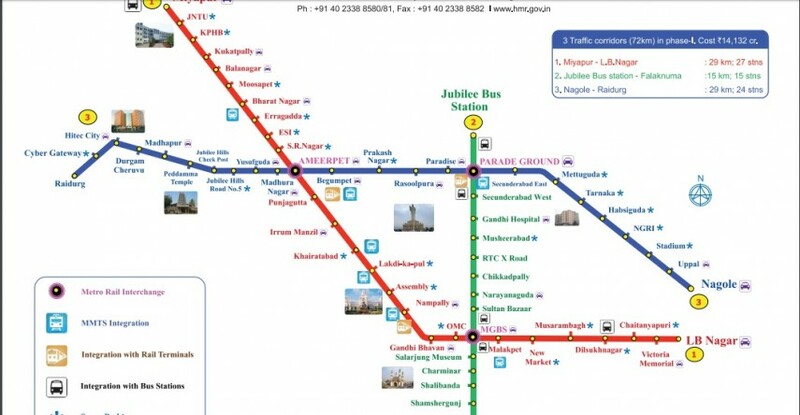 The stations on this stretch include Nagole, Uppal, Survey of India, NGRI, Habsiguda, Tarnaka, Mettuguda, Secunderabad, Parade Grounds, Paradise, Rasool Pura, Prakash Nagar, Begumpet, Ameerpet, Madhura Nagar, Yusuf Guda, Road No 5 Jubilee Hills, Jubilee Hills Check Post, Pedamma Temple, Madhapur, Durgam Chervu, HITEC City and Shilparamam. Parade Grounds and Ameerpet stations will provide interchange option to access the Green and the Red Line, respectively. Corridor-III (Green Line): The 15-km stretch will run between JBS and Faluknuma with over 14 stations. These include JBS, Parade Grounds, Secunderabad, Gandhi Hospital, Musheerabad, RTC Cross Roads, Chikkadpally, Narayanguda, Sultan Bazar, M G Bus Station, Salarjung Museum, Charminar, Shalibanda, Shamsher Gunj, Jungametta and Falaknuma. This route is expected to become operational by the end of 2019. Planned in two phases — a 9.66-km stretch from JBS to MGBS and a 5.36-km stretch from MGBS to Falaknuma — the route is under construction. The two interchange stations on this route are Parade Ground and MG Bus Station. Unique stations: The Metro stations in Hyderabad will promote the cultural heritage of the city in their designs. Also, these stations will be well-equipped with energy efficient features, proper signages, convenient skywalks, parking area, facilities for the disabled and other commuter-friendly facilities.The stations will also be equipped with automatic ticket vending machines and automatic fare-collection system. Inter-modal connectivity: The project is designed in such a manner that it connects to the other modes of transport, including existing rail terminals, MMTS and bus stations. This will help provide last-mile connectivity to commuters. Fare: The base fare for a distance of upto two km will be Rs 10, while the highest fare will be Rs 60.